Recently, I had the pleasure of shooting some videos with my good friend, Yoga For Golfers founder, Katherine Roberts, along with Notre Dame and NFL football great, Joe Theismann. 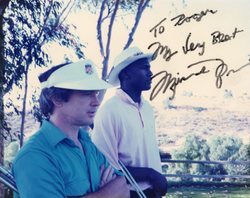 As always, it was a thrill for me to discuss with Joe, the similarities between throwing a football and hitting a golf ball. Joe, like many athletes, is absolutely obsessed with golf, and we had a great time discussing the similarities of both sports, especially; weight transfer and hip rotation. Although many (or most) people can’t see the similarities between playing football and golf, but being expert at both, Joe certainly does. One thing for sure, both “sports” DEMAND leg strength, and without leg function, the pelvis won’t function efficiently. As I’ve said many times, a round of golf is about a 5-7 mile walk, and we golfers are walking these miles in a forward and bent over (or flexion), position. Besides walking that 5-7miles every day, don’t forget that we’re also standing on our feet while we practice our short games and long games. Doing this for a lifetime, it’s no wonder why we golfers have “tree trunks” for legs and incredible upper body flexibility from doing the upper body twisting while making our shoulder turns. One difference between the two sports however, is that football requires more “bulk” training to sustain the constant pounding that takes place when behemoth men crash into one another. This excessive bulk is NOT necessarily good for most golfers simply because bulky muscles will usually retard flexibility – and good golf DEMANDS superb upper body flexibility! After a couple of days on the set, we were able to convince Joe to lighten up on the weights, and amp up his flexibility training. Being a great athlete and QB, it wasn’t hard to teach this “very coachable” superstar. Stay tuned for our upcoming videos.